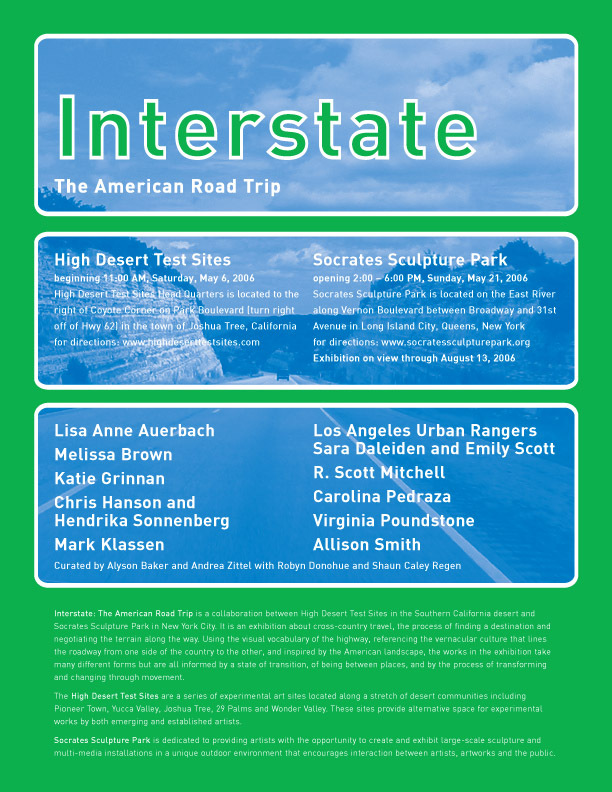 Interstate: The American Road Trip is a collaboration between High Desert Test Sites in the Southern California desert and Socrates Sculpture Park in New York City. It is an exhibition about cross-country travel, the process of finding a destination and negotiating the terrain along the way. Using the visual vocabulary of the highway, referencing the vernacular culture that lines the roadway from one side of the country to the other, and inspired by the American landscape, the works in the exhibition take many different forms but are all informed by a state of transition, of being between places, and by the process of transforming and changing through movement. High Desert Test Sites are a series of experimental art sites located along a stretch of desert communities including Pioneer Town, Yucca Valley, Joshua Tree, 29 Palms, and Wonder Valley. These sites provide alternative space for experimental works by both emerging and established artists. The artists and Socrates Sculpture Park would like to thank: AZ, Jeni, everone who pitched in to get the bike moving, Standard Screen Supply, Voiceplus Communications, Marie Lorenz and Matt “the brother” Lorenz, Abbey Williams, Dave Hardy, Siebren Versteeg, Violet and Bill Brown, Tim Rogeberg, Joel Seales, Spencer Stair, Dawn Casper, Noah Wolf, Robby Herbst, ACME, Guggenheim Foundation, Kathleen Kennedy, Beloit College, Deborah Fisher, Mark Thomas, Machine Histories, Julie Phanstiel, John Pylypchuk, Meaghan Reid, Hector and Pilar Pedraza, Daniela Soto, Natalia Soto, Thomas Roach, Christina Ryan, Kevin Olson, The Aldrich Contemporary Art Museum, Stephanie, Jeremy Glanner, Ken Beeker, Torbitt Schwartz, Steven Baldi, Highway Steel, Paul, Rob, Ben, Anne, James, Jim, Ijan, Darius, Kate, Joel & the folks at Mark’s, Pat, Michael, David, Jay @ DOT, The Kyungs, Frank for fixing the welder and E&T Plastics. With special thanks to: Plant Specialists, Film Chefs Restaurant. This exhibition is made possible by contributions from: Altria Group, Inc., Aronson Foundation, Lily Auchincloss Foundation Inc., Carnegie Corporation of New York, Robert Sterling Clark Foundation, David R. and Vivien Collens, John Connelly, Constance and Fuller Cowles, Mark di Suvero, The Fifth Floor Foundation, Maxine and Stuart Frankel Foundation, Hugh J. Freund, The Horace W. Goldsmith Foundation, Agnes Gund and Daniel Shapiro, Independence Community Foundation, The Peter T. Joseph Foundation, JPMorgan Chase, Gabrielle and Herbert Kayden, Jennifer McSweeney, Richard and Ronay Menschel, Ivana Mestrovic, National Endowment for the Arts, New York State Council on the Arts, The Ross Foundation, Irving Sandler, Rev. Alfred R. Shands III, Mr. and Mrs. Thomas W. Smith, Starry Night Fund of Tides Foundation, Andy Stillpass, Strypemonde Foundation, and The Van Lier Fund in The New York Community Trust. 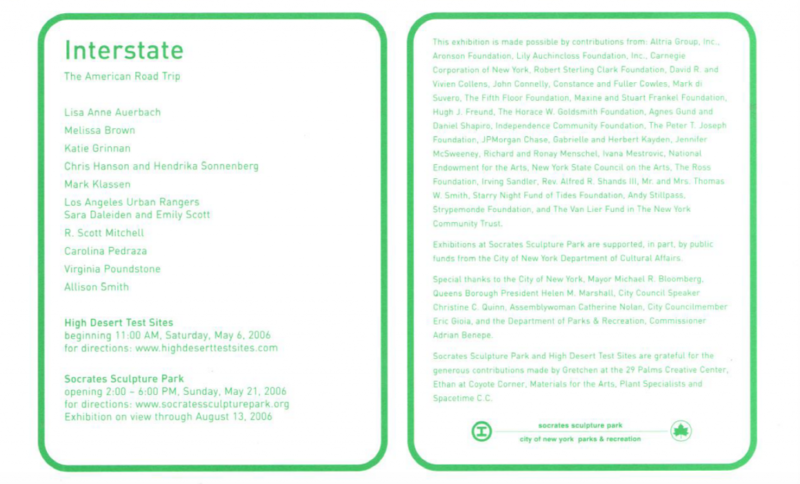 Exhibitions at Socrates Sculpture Park are supported, in part, by public funds from the City of New York Department of Cultural Affairs. Special thanks to the City of New York, Mayor Michael R. Bloomberg, Queens Borough President Helen M. Marshall, City Council Speaker Christine C. Quinn, Assemblywoman Catherine Nolan, City Councilmember Eric Gioia, and the Department of Parks & Recreation, Commissioner Adrian Benepe. Socrates Sculpture Park and High Desert Test Sites are grateful for the generous contributions made by Gretchen at 29 Palms and Wonder Valley, Creative Center, Ethan at Coyote Corner, Materials for the Arts, Plant Specialists and Spacetime C.C.